What is your most embarrassing driving mishap? I’ve hit a roadblock at work and this topic has been on my mind. I’ll go first. Before the WRX I had a ‘96 Toyota Tacoma with a 5 speed, a 2.4l 4-cyl, and...not much else. The truck only had 142hp and 160lb-ft of torque, but being as there was nothing to weigh down the rear combined with the manual transmission, overpowering the rear tires and breaking traction was very very easy. On this particular Friday I was driving home from work, eager to start the weekend. Looking back I’d say I was too eager. It had been raining all day, and was continuing to drizzle on my drive home. I was approaching a a T intersection and had to turn left on the crossing road. This intersection wasn’t a perfect T so if the light was green you could drive the left turn like it was a long sweeper. This was also a two lane left turn. On this day the light was green and I was in the right left turn lane, but it was very very stale, and I knew that and picked up the pace. Yellow. I hit the gas again for a little speed boost so as to not run a red and then quickly hit the brakes to slow down for the turn. In doing this all the weight had transferred forward. so as I turned into the road I didn’t realize the rear was still rotating around. I shoved it into second and touched the gas which exacerbated the slide. Now the front of my truck was starting to point toward the SUV in the lane to my left. I panicked. I made such a basic car control mistake. I hit (stood on) the brakes and yanked the wheel to the right. It worked I guess as I had changed direction and slowed down, but lack of antilock now meant my tires were coasting in the thin layer of water in the road. I was basically a passenger as my truck slowly slid sideways down into the fairly steep, 8’ deep drainage ditch on the side of the road. There was a light crunch and it was over. I jumped out and took a quick look around the truck and saw there was no major damage but I found myself feeling like a deer in the headlights. My dad worked nearby where I had this accident so I called him, he offered to call a tow truck for me and I accepted. While standing there waiting in the misaerable drizzle, feeling shame as hundreds of commuters passed by and observed my handi work, a Good Samaritan stopped and offered to go grab some tow straps from his buddy’s house nearby and pull me out if I gave him a little cash. I told him if he could beat the tow truck then the job was his. He beat the tow truck. And this actually very easily could have been my worst decision of the day. The reason for that is that I had to steer my truck up the steep side of the ditch. This may have been the sketchiest thing I’ve ever done as I was convinced I was going to roll over back down in to the ditch. However, I made it out, I called and cancelled the tow truck, we unhooked and made arrangements to meet at the gas station down the road that had an ATM. I gave him $60 when I got there. Looking back I realize this also could have been a dumb move as it could have been a setup. Luckily there was no damage to the truck aside from maybe some paint damage as there was some thick brush at the bottom of the ditch that the passenger side of my truck had rested on. I will never forget the shame of standing there on the side of the road, truck in a ditch, with people rubbernecking to get a look at the idiot, honking to signal either their indignance or that they had been entertained by my dumb mistake. That day I learned not to overestimate my driving skills, underestimate road conditions, and that it’s better to get home later and safer, than never. 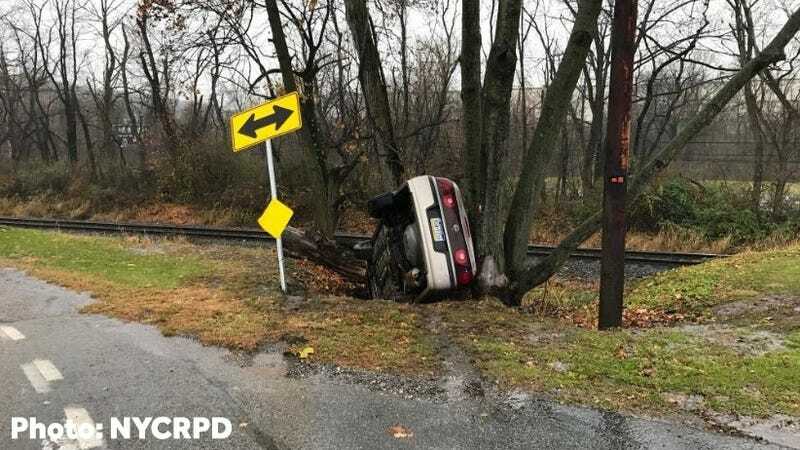 Anyway, OPPO, what is YOUR most embarrassing driving mishap?